With the standard On/Off DC Thruster System you must "feather" the unit on or off in order to deliver optimal propulsion. Generally controlled remotely via joystick or control system, the boat thruster is either ON and delivering powerful thrust or it's OFF in anticipation of your next move. Ignition Protected and Standard casing for the On-Off Series of SidePower's bow and stern tunnel thrusters. 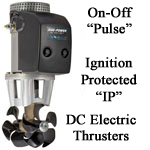 Ignition Protected or "IP" bow and stern thrusters have a hermetically sealed compartment and are typically used on gasoline powered vessels. On-Off thrusters are available with "push" strength up to 170kg. 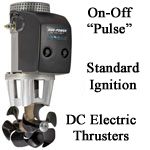 There is no open spark or electrical wiring with Ignition Protected thrusters. The casing completely waterproofs the electronics of the thruster making it perfect for use in confined or leaky areas where it may come in contact with water or gas fumes. The Ignition Protected case prevents combustion of fumes as well as unwanted damage to sensitive components. Standard model bow and stern thrusters are unsealed units that are usually used on diesel powered vessels because the fumes do not ignite with a spark. Standard On-Off thrusters are available with a "push" strength up to 240kg.